It was a great year for the Foundation and I’m happy we were able to help so many great organizations and people in need. 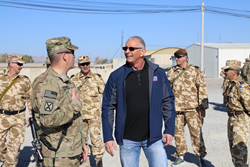 Two of the most valuable lessons that Robert Irvine ever learned are these: 1) A free society can only be free because of the brave men and women who serve its military; and 2) The more we share, the more we ultimately have. Giving for the sake of giving is its own reward. Giving to those who defend the nation serves an even higher, and necessary, purpose. These two lessons combined to serve as the guideposts for Robert’s career. Indeed, much of his work on television over the past decade has been focused on lifting others up. But even when he’s not working, Robert has been using nearly every spare moment of his free time to volunteer. For the past several years, that volunteering is done primarily for the USO and as an ambassador to the Gary Sinise Foundation. In 2016 he spent 65 full days volunteering his time and talent to these and other charitable organizations, visiting military bases here in the U.S. and war zones throughout the Middle East, including spending Christmas Day in Iraq with his wife, Gail. These lessons also form the backbone of The Robert Irvine Foundation, which raises money and issues grants to military charities and other organizations who work directly with veterans and those currently serving to improve their way of life. The Robert Irvine Foundation also accepts applications and provides direct grants to the veterans and their families who need it the most. In the 2016 fiscal year, the foundation raised $101,812 through corporate and individual donors, with a portion of this total being allotted by Robert Irvine Foods and Robert Irvine Products. The full 100% of the total donations received was distributed through the foundation’s grants program. Funds for the Robert Irvine Foundation are generated through a portion of sales of Robert Irvine Foods, Fit Fuel, Robert Irvine Live! and more. The mission of the AVC is to guard the legacies and honor the sacrifices of all American veterans. Through oral history preservation, educational programs and civic events, the AVC preserves the stories and lessons of veterans past and present, from which future generations can learn. This year’s grant was used to fund transportation support for the 2017 National Memorial Day Parade. The National Memorial Day Parade, held annually along Constitution Avenue in our nation’s capital shares the story of American honor and sacrifice from across generations. The parade, commemorating its 12th year, is our nation’s largest Memorial Day event, drawing hundreds of thousands of spectators to the National Mall to pay tribute to those who have served, are serving, and most importantly, those who have made the ultimate sacrifice while in service to our country. Buddy Cruise is a 501c3 non-profit charity providing educational opportunities and resources for families, while promoting awareness, acceptance, and inclusion for individuals with Down syndrome and developmental delays through unique venues. The USO was founded in preparation for World War II by national leaders who understood that maintaining high morale in a fighting force is vital to a nation’s military success. Over time, the USO has become the vital bridge between Americans and their military service members. The USO is a family of volunteers, sustained by the charitable contributions of millions of generous Americans. The USO is united in its commitment to support America’s service members by keeping them connected to the people, places, and things they love. The USO does this through countless acts of caring, comfort, connection, and support. Its work is America’s most powerful expression of gratitude to the men and women who secure our nation’s freedoms. Chef Irvine has appeared on and hosted a variety of Food Network programs, including Dinner: Impossible, Worst Cooks in America, Restaurant: Impossible, A Hero’s Welcome, All-Star Academy, Guy’s Grocery Games, Chopped Impossible and Restaurant Express. Chef Irvine launched a new talk show series on the CW in 2016 – The Robert Irvine Show. The show focuses on dishing up advice and conflict resolution guidance for everyday people facing a range of problems. For more information on Chef Robert Irvine, visit http://www.ChefIrvine.com.